Cala Gracio holidays take you to an oasis of peace and tranquility which, given its location, is rather surprising as it is only a short stroll away from San AntonioTown, Europe's undisputed party capital. 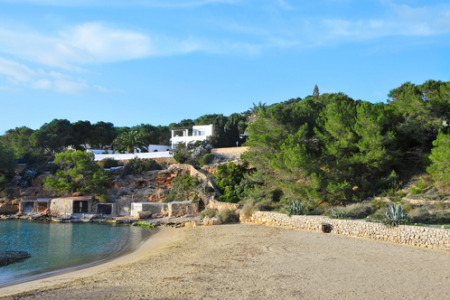 The resort has two soft sandy beaches which lie sheltered in deep coves. It is a pretty area, with the dark green of the bushes growing above the water line contrasting sharply with the bright turquoise waters. The combination of sand and warm shallow water attracts families and the relaxed atmosphere draws couples of all ages. The proximity of San Antonio is perfect for those for whom the ideal holiday is finding a quiet spot in the sun followed by high octane entertainment from dusk to dawn.